Pac-Man Game Review - Download and Play Free Version! Entertaining and easy to play. Classic arcade game on your PC. Regular and Enhanced mode for newer graphics. Different difficulty settings so you can play at your level. No level variety can get boring. Not a Clone or Remake - The Real Thing! 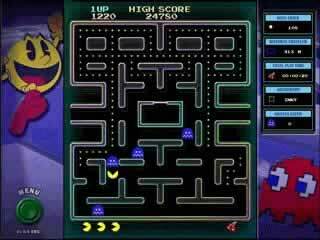 PAC-MAN, the world famous arcade classic, returns in this faithful rendition right on your PC! Who can forget the countless hours and quarters spent avoiding pesky ghosts while chompin' on dots and gobbling up the fruit for bonus points? Relive the Retro Arcade Action! Check out the new Enhanced Mode with updated graphics and sounds! Play through all 256 dot-chomping levels and test your skills with all new stats! Munch fruit and other items for big points! Chomp all of the dots to advance to the next stage. Gobble blinking Power Pellets to weaken ghosts temporarily and eat them up before they change back! If you have been waiting for a real version of this game, wait no longer! 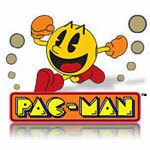 Get Pac Man now and enjoy one of the greatest video games of all time! Chomp a Power Pellet to momentarily turn the ghosts blue. When they're blue you can eat them for bonus points! Gobble up the fruit for extra points! Get an extra life when you reach 10,000 points! Keyboard - Pressing an arrow key will move PAC-MAN in the corresponding direction. Gamepad - Pressing a direction on the direction pad will move PAC-MAN in the corresponding direction. Mouse - Move the mouse to move PAC-MAN in the corresponding direction. Make fast turns by pressing in the desired direction just before you reach a corner. Easy: For beginners and you start with an extra 2 lives! Original: Exactly like the arcade version! The classic arcade game we all know and love is back for your PC. Pac Man provides all the entertainment you would expect in an easy to download package. This is the original game, not a remake. Get ready for some arcade nostalgia as you relive the glory days of Pac Man. For those of you who haven't played Pac Man, the game is very easy to understand but can be very challenging as you get farther into the game. The goal is to maneuver Pac Man, the yellow circle with a mouth, around the map consuming all the dots. Four ghosts will be wandering around the map attempting to stop you from eating the dots. If you run into a ghost you lose a life, once you have lost all your lives the game is over. There are four dots that are larger than others placed in the corners of the map. Consuming these dots renders the ghosts harmless and you can eat them for extra points. Occasionally in a level various fruit will appear in the center these also can be consumed for extra points. Extra lives are earned for every 10,000 points you earn. Controlling Pac Man only utilizes the arrow keys. The map is 2D and Pac Man is always moving forward so you will only need to steer him left, right, up, or down. The menu options are selected with the mouse. Pac Man allows you to adjust the difficulty settings, what level you start on and a choice between original and enhanced mode. Original provides the game as it was in the arcade. Enhanced mode has updated graphics and sound for a slightly different Pac Man experience. The graphics in this game are identical to the original game in Original mode. The Enhanced mode graphics add a slight 3D effect to the borders and maze. They are not great, but they also don't detract from the game. The game also has a simulated appearance of an arcade machine as the border for the game. The sound is great, it matches the arcade machines perfectly. If you haven't played Pac Man before, and don't know what to expect, there isn't a lot of variety level to level. Each level is the same maze with the same four ghosts and the same location for all the dots. The only changes level to level are how fast the ghosts move and how long the large dots that allow you to eat ghosts last. While this makes the game more challenging, it doesn't keep the game interesting. 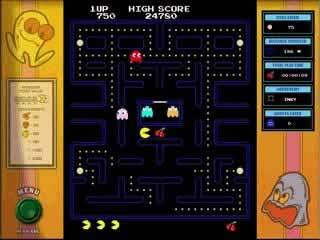 Pac Man is a legendary arcade game that has survived the ages and can still be found today in modern arcades. You may have played this game when you were a kid and want to have a bit of fun remembering what it was like. Even if you have never played Pac Man it is never to late to start. The easy controls and premise make this game great for all ages and fans of any genre. Download the trial and you will be hooked for sure.